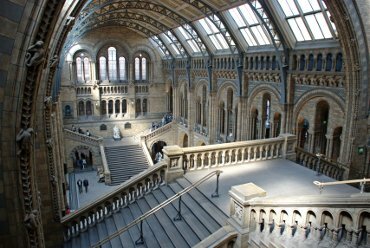 BeenThere-DoneThat: Views of the Natural History Museum, South Kensington, London. 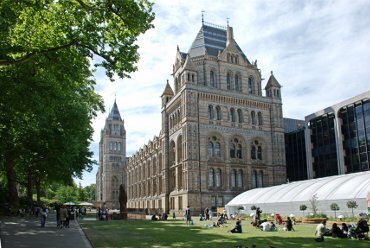 Natural History Museum, South Kensington. Work on this amazing building began in 1873 and was completed in 1880. The new museum opened in 1881, although the move from the old museum was not fully completed until 1883. An interesting feature is that the interiors and exteriors of the building make extensive use of terracotta tiles to resist the sooty climate of Victorian London which, thankfully, we no longer have to contend with. 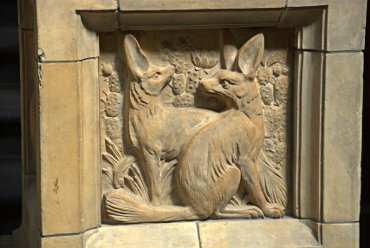 The tiles and bricks feature many relief sculptures of flora and fauna, with living and extinct species being featured. The cathedral-like entrance of the museum leads into the ornate Central Hall which has been likened to a church interior. It would be a wasted opportunity not to look at some of the architectural details of this impressive hall. The Minerals Gallery is just as it would have been in 1881 including the original oak cabinets. 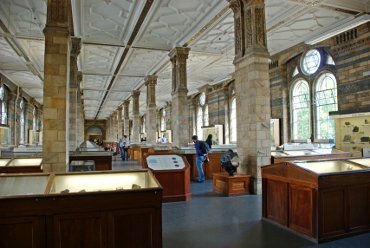 The architectural features of this gallery are worth a look as well as the mineral exhibits which are pretty impressive. 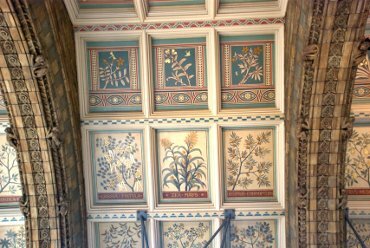 A detail of the ceiling in the Central Hall showing the painted panels which, apparently, are not as ornate as originally planned so as to reduce the original cost. I wonder what the ornate ones would have looked like? The decorative stone arches also merit more than a cursory glance with their carved relief tiles and climbing monkeys. One of the numerous carved relief panels. This panel appears to feature Desert Foxes or something similar going by the size of those ears and notice all the Cacti on the background with one even in flower.